Eventing this year is hosted by the Burghley and the following test will be used. Area 6 will be holding an Eventing League during 2018 for both individuals and branches at PC80, 90, 100 and 110cms Levels. There is no fee or entry form required and all individuals and their respective branches will be automaticallyincluded in the league for entering the below competitions. Standings will be published each month on the new Area 6 Eventing League page on The Area 6 website (http://branches.pcuk.org/area6/). 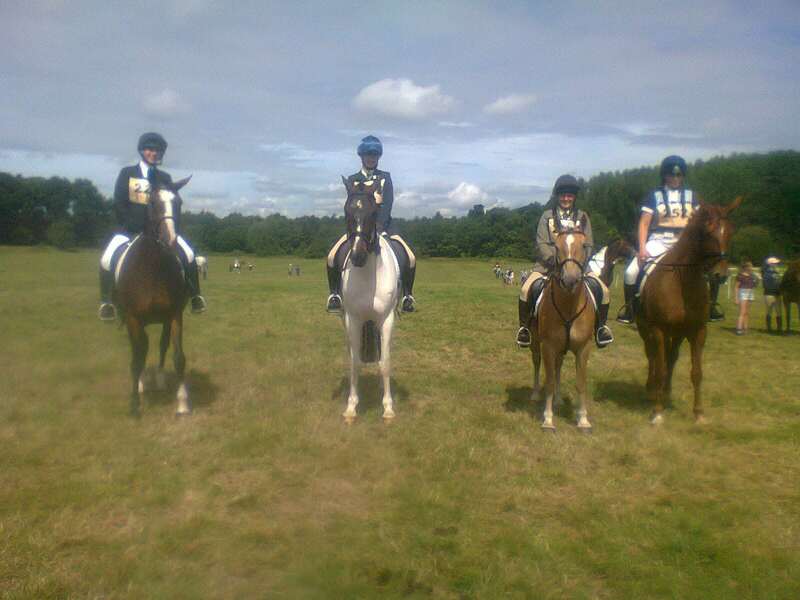 The aim of the league is to encourage Members to compete at all levels of eventing. 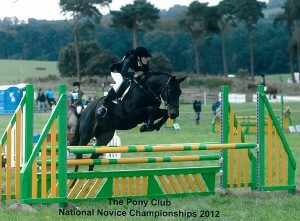 All League Classes will be run strictly under 2018 Pony Club Eventing Rules. Please note further dates may be added if Area 6 branches announce future ODE’S during 2018, also not all the above dates will feature all 4 height sections at their events. Frankie Maw rode her gelding Major today, as a representative for our branch, as part of our Novice Eventing team, here’s her personal roundup. Evie-Mai Carolan rode her pony Livvy. Our girls are super in all ways, Very Well done! Our grassroots team, report to follow. 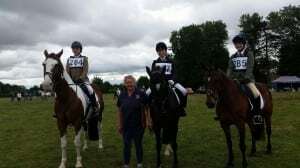 We had an open team of 3 members Katie Willerton, Lauren Wilson and Amber Major, the team finished in 4th place, Amber was 8th and Lauren 10th in their sections, well done to you all. we also had 2 novice teams, both unplaced but with some outstanding results as individuals Mary Maw finished on her dressage score of 36.3 clear show jumping clear cross country and finished in 10th. Katie Holbrook also finished on her dressage score of 38.8 (clear show jumping and clear cross country) but finished just outside the top 10, Sinead Bramhill dressage of 31.00 also went clear show jumping and cross country but had 7.8 time penalties finishing with a score of 39.8 to finish 6th in section. Chelsey Wesley dressage of 31.3 clear show jumping and clear cross country but with time penalties finished on a score of 75.7 Frankie Maw dressage 31.5 show jumping 4 faults and had a fall on cross country. Grace Carruthers dressage 33.1- 4faults show jumping, faults on cross country. Charlotte Wolstenholme dressage 344 – 4 faults show jumping clear cross country and within the time finished in 10th place. Georgia Wright dressage 28.5 – 4 faults show jumping, clear cross country and within the time finished 1st. Georgia Wright and Dollar qualify for the National Championships later in August, she was the only eventer to qualify but the others were knocking on the door, just need a little more luck and we could have 3/4 more at the championships, we wish Georgia and Dollar good luck at the championships. 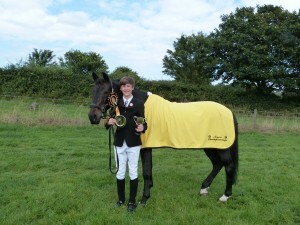 Full results are available on the area 6 web page and the Belvior Pony club web page. The Open eventing team Georgia Harness on Horsepasture Chalkie , Nicola Whitmore on Fernhill Sirocco Dr 32.2 – sj 8 – xc clear 7.6 time- Joe Dowse on Valley Dr 37.8 -sj 8-xc clear 1.6 time and Lauren Wilson0n Kilmeady- Dr 34.4 -sj 16 +5 -xc clear 20time, team came 4th at Area 6 qualifies on Saturday 23rd August and qualified for the National Championships later on in August, Good Luck for the championships team.Joe came 5th in his arena Nicola came 5th in her arena , Lauren Wilson 9th in her arena, Amber Major on Bertie McSquirty- dr 31. – sj 12- xc clear 15.6 time went as an individual in the open and came 7th in her arena, thank you all for making Scunthorpe and district a proud branch Well done to you all. We didn’t have an intermediate team , Hannah Barth on Oscar -Dr 26.92 -sj 8 – xc clear 28.12 time and Laura Bramhill on Mollyatta dr 34.23 sj 12 xc clear 25 time went as individuals, Hannah finished 7th in her arena Well done girls a great result. 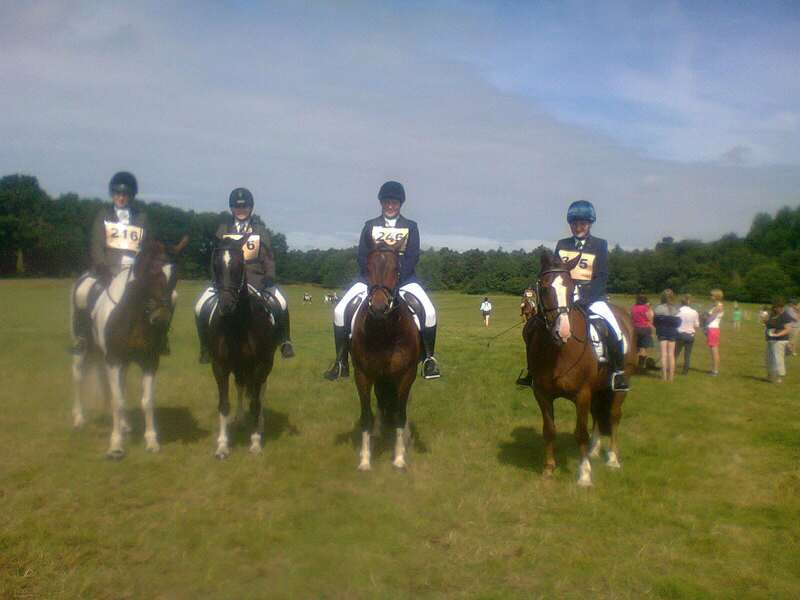 The Novice eventing team came 4th another great result, the team was Mary Maw on Apache Prince Dr 38.96 – sj clear -xc clear and came 10th in her arena, Georgina Jenks on Dollar-Dr 29.58- SJ clear – XC clear 2 time and came 5th in her arena, Amelia Priest on Angelica -Dr 34.58 – sj 4 – xc clear 3.2 time and came 7th in her arena and Sinead Bramhill on Peasano Ebony Rose – Dr 36.46 – sj clear – xc clear 0.8 time came 12th in her arena, Katie Holbrook on Max went as a individual Dr 38.75- sj clear – xc clear 32.8 time, well done girls and thank you for representing the club in such great style, well done to the members who jumped double clears. Joe Dowse on Buddy won, yes won, the Novice championships in Cheshire, This I believe is a first for Scunthorpe and for Area 6, what an achievement to come out top of all the novice eventers in all of the other pony clubs, its mind blowing, Joe was 4th after dressage and then jumped clear show jumping and clear round a big, technical cross country course to move himself in to the lead, and into a position that he could not be beaten. This is quite amazing knowing what Buddy has been through and Buddy is now 21 years old this was his swan song as now he is going back to his former owner Charlotte Torr (past member ) he is going to be semi retired as Charlotte intends to ride and maybe hunt him. 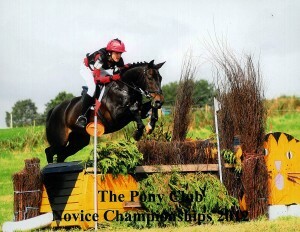 Happy retirement Buddy and thank you for what you have done for the Pony Club. 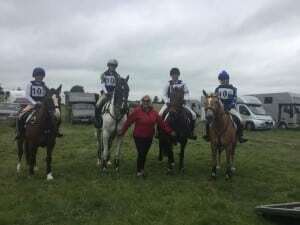 Novice Eventing Championships – Joe’s report. After a week of torrential rain, the morning of the area eventing dawned fine and dare we say, even sunny! 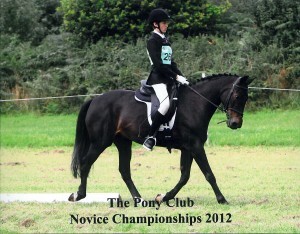 Poor Nic was up even before the dawn I think, her first dressage test was something like 8.30! The ponies all behaved in the dressage and we were rewarded with good scores for all 3 tests. I shot off to run round the cross country while nic showjumped and cross countried Toto, having just one pole in the showjumping, and going clear in the time xc. After walking the cross country I was all set to withdraw, there was one section that was very muddy at the start of the course and I didnt want to slip. However on the way back to my box I walked past Nic and Jo, who told me there was absolutely no way they were going to let me withdraw, Nic said she had no problems on Toto and Louis had had enough of posey dressage and deserved a nice jump around! So they changed my mind, and I can honestly say I would not have done it without them! So we wandered up to the showjumping with Nic and Rocco where they both jumped clear rounds, and headed straight back to the cross country. After a pep talk from Nic, she headed off to jump clear in the time, then Louis and I jumped around clear for just 3 time faults, totally my fault for taking a rather scenic route to the last fence! When the results came out, Nic was 3rd on Rocco in her section, I had WON my section on Louis an qualified for the championships (!!!) and Nic was 7th on Toto, just one place out of qualification. Louis and I were also presented with the trophy for the best dressage! We had a fab day and the organisers did so well to keep the event running, it must have been difficult, especially when all events round the rest of the country had been abandoned!